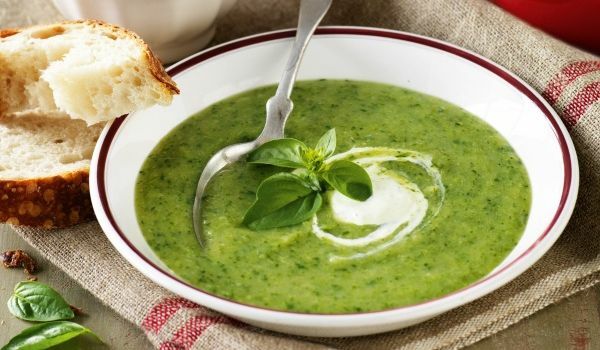 Spinach Soup is an easy to prepare American dish that is generally relished by all health freaks. The flavor of the garlic and onions that are added to it, make it extremely tasty. The soup is generally had during winters for dinner. Take a pan and heat oil in it. When the oil gets hot, put onions and garlic in the pan and saute for a few seconds. Now, add chopped spinach to it and again saute it for 2-3 minutes. Pour 1½ cups of water in the pan and bring it to boil. Remove from the heat and let it cool down. Using a hand blender, make a puree of the above mixture and then add milk, pepper and salt. Mix well. Put the soup in a deep pan and bring it to boil again. Serve hot.